Almost seven years after a RAM scribe wandered into Sydney’s Manzil Room and staggered out blubbering ‘Excitement, passion and romance are apparently in style,” one of Australia’s finest rock ensembles is bidding farewell to a remarkably loyal legion of fans with an emotion-charged farewell Tour. The outfit emerged from the north shore/northern beaches area of Sydney during the summer of 1980 as a melting pot band which drew members from such obscure but admirable entities as the Bigola Bop Band, This Side Up and the Great Dividing Band. Tastes and backgrounds were diverse but there were common bonds of musical appreciation – Mink DeVille, Otis Redding, Graham Parker, Marvin Gaye and Bruce Springsteen among them. Soul-freak Alex Smith sang, to quote on critic, “In a most remarkable fashion. His voice is full and resonant and has a power and range that is unique in the rock world.” Indeed he could, and still can, soar, sweep and serenade with tempestuous vocal chords, at the same time ensnaring his audience with a stark commitment. 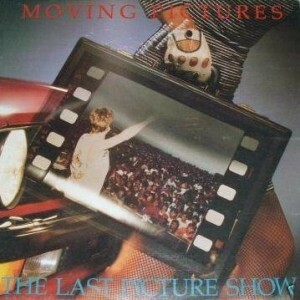 Signed to Wheatley Records in 1981, Moving Pictures achieved the remarkable feat of simultaneously holding down the national number one single and album position. The quad-platinum L.P., ‘Days of Innocence’, stayed at the summit for seven weeks, while the single managed six. The hit was, of course, the soaring, anthem like, ‘What about Me?’, which touched a responsive nerve within Australians and Americans alike. During 1982/83 Moving Pictures were hot chart property, with the follow up hits, ‘Winners’ and ‘Back To The Streets’, and a second album, ‘Matinee’. ‘What About Me?’ made top thirty on Billboard in the U.S. and the band was invited to contribute the track, ‘Never’, to the mega-huge ‘Footloose’ soundtrack album. Sadly, it was in dealing with America that Moving Pictures’ problems began. Signed to the Network label through Elektra, they found themselves unpromoted and unable to record after the companies took a giant stumble. Network signing Irene Cara took her gripes to court. Moving Pictures decided to tough it out. The long wait began. To no avail. Hence The Last Picture Show.